The design and fit of the Drivemaster model has been a favorite of GPO customers for years. 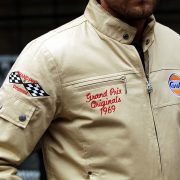 A top jacket with a lot of detail and practical pockets that embodies the Drive & Lifestyle from Grandprix Originals. 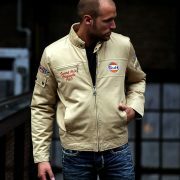 Excellent workmanship and premium canvas make this jacket a daily driver for many customers. an all-season jacket. Make it yours! 85% cotton 15% nylon, lining 100% nylon.